There is a tough, fibrous structure on the under-surface of your foot called the “plantar plate”. It covers the joints at the base of your toes where you push off when you step forward or jump. The plantar plate helps keep the toe aligned, and when injured it results in a “crossover” or “floating toe” deformity. Some plantar plate tears occur as a result of injury, but most are the result of a chronic, degenerative process. This occurs most commonly in the second toe, but can happen in the others as well. Other foot deformities, like bunions, may make plantar plate tears in the adjacent toes more common. Individuals with plantar plate tears often may seek medical attention when they notice a deformity of the affected toe or when they can no longer fit in their desired shoe wear. Deformities may not be present early, but in severe cases, the affected toe can cross over adjacent toes. Patients may complain of aching or sharp pain at the ball of the foot that is worse when they spend extended periods of time on their feet. Calluses may also form on the tops of toes from abnormal rubbing against shoes. Surgeons may suspect this diagnosis based on your history and physical exam alone. X-rays or ultrasound are often performed to assess alignment of the toe and MRI may be helpful as well. Shoe wear modification may be helpful to reduce the patient’s pain, but it will not prevent recurrence or progression of the deformity. 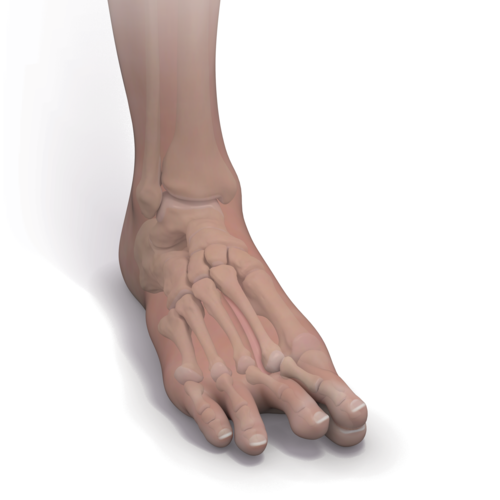 Every situation is unique, but some doctors advocate for earlier surgical fixation of plantar plate tears, so the injury doesn’t lead to other lesser toe deformities. It is possible to repair the plantar plate directly using a 2-3cm incision on the top of the toe. By removing the diseased tissue and securing a healthy portion of plantar plate back to the toe, the deformity and pain can be corrected. Most plantar plate repairs will also involve moving the metatarsal bone back with a corrective osteotomy (bony procedure). 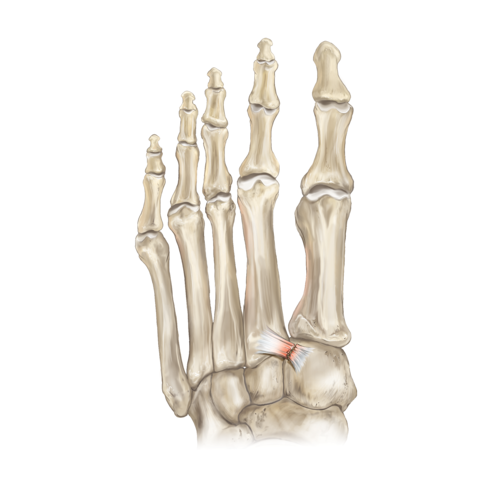 The Lisfranc ligament connects the midfoot to the forefoot by attaching the medial cuneiform bone to the base of the second metatarsal bone. When this ligament is torn, the bones of the foot will begin to separate. If this ligament is not repaired, arthritis will develop. Common causes of Lisfranc injuries include: low-energy, sports-related twisting injuries of the foot and high-energy injuries such as motor vehicle accidents. The classic history for a Lisfranc injury would be a rider who gets his foot caught in a stirrup after falling from a horse. Patients may complain of severe pain and swelling in the foot. Tenderness to palpation and inability to bear weight may also be present. Physical exam reveals severe swelling and pain in the midfoot. X-rays may show widening of the joints between the bones of the midfoot and the bones of the forefoot. Multiple Lisfranc fractures are commonly associated with high-energy injuries. Tears in which the midfoot/forefoot relationship remains stable can be treated non-operatively. Non-weight bearing while the soft tissues heal is stressed. 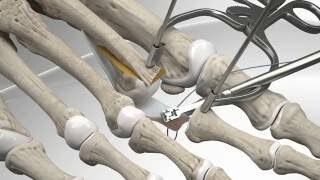 Open reduction of the joint with internal fixation using screws or pins is recommended for joints that have visible separation on X-ray. Arthrex has Lisfranc injury solutions that do not require a second surgery for removal of hardware.